When Ro was going on a visit to Germany and Austria for the annual music messe in the last week of March this year, I decided to make this cheesecake as a send off treat for him. He would be away from home for more than a week and this was my way of showing the special man in my life that he would be missed! I even packed a slice for him for his onwards journey, to exonerate him from the boring and insipid flight food. Strawberries are quite special to me. They look and taste wonderful and there are such amazing ways to utilize them. They are almost gone and out of season here in India and I was lucky to make this from the last batch of strawberries delivered at my doorstep from my fruit seller. I call this recipe a vegetarian strawberry cheesecake instead of simply calling it strawberry cheesecake or eggless strawberry cheesecake because I have been overwhelmed many a time, going to a restaurant, a cafe or a bistro and eyeing a luscious looking piece of cheesecake and not being able to eat it because I’m a vegetarian and most cheesecakes contain the dreaded gelatine, a vegetarian's foe usually present in mouthwatering desserts. It is surprising how in India eggs are considered non-vegetarian and desserts with gelatine are passed off as vegetarian. This cheesecake is full of flavour and a perfect way to highlight the lusciousness of strawberries. To bring out the authentic taste of a good cheesecake, I experimented with Philadelphia Cream Cheese, which apart from being doubly priced is not easily available in India. It is one of those desserts which is quite simple to make but looks as if you have toiled for hours.The next time I make cheesecake, which is going to be quite soon, with my favourite fruit mango, I intend to use all easily available local ingredients. Stay tuned! One of the highlights of this cheesecake is the topping. It is easy to make but looks attractive and tastes exquisite. 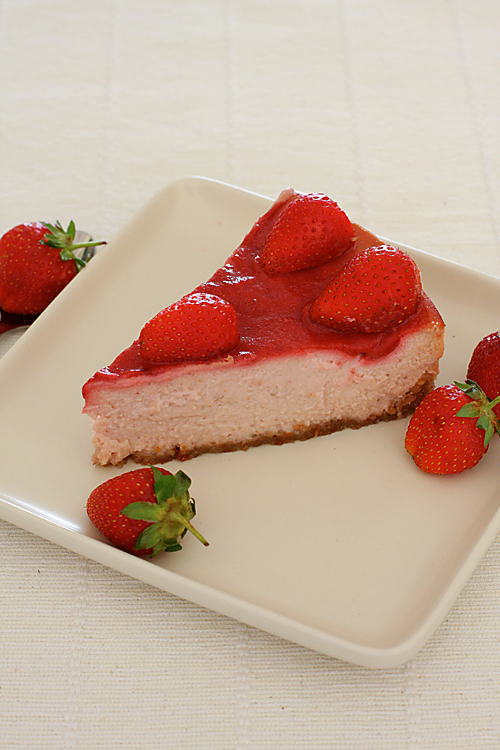 It helps to bring out the flavour of the strawberries in this cheesecake. 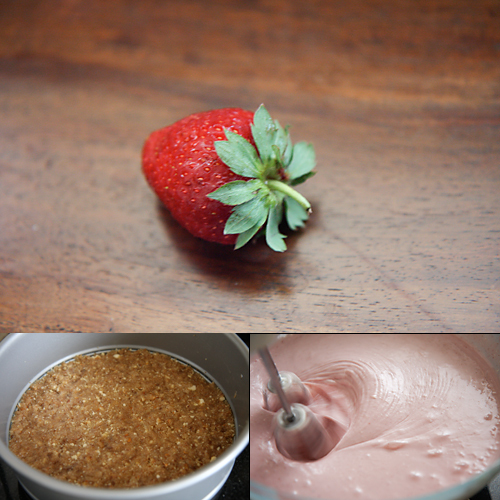 In a blender or food processor puree strawberries and sugar until smooth. Keep aside. In a bowl, mix all the ingredients for the base and press into a greased 9 “ (23 cm) springform pan. In the bowl of a stand mixer or food processor or with a hand blender whip the cream cheese until smooth. Beat in condensed milk, strawberry puree and vanilla. When smooth, mix in the yogurt and beat until well mixed. Pour the cheesecake mixture into the prepared crust. Gently pour the strawberry topping over the cheesecake mixture and tilt the pan to make it spread evenly. Bake in a preheated oven at 160 degree centigrade, 325F, gas mark 3 for 25 to 30 minutes or until set. Bring to room temperature and chill well, for atleast 3 hours in the refrigerator before you serve. Lovely! You could try using homemade mascarpone cheese also for making cheesecakes! 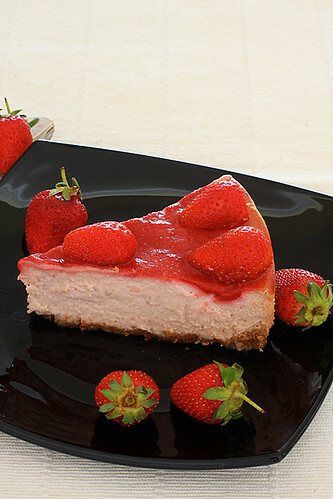 Yummy cheesecakes and yummier clicks…I can see how much you love strawberries!!! Did your son have them too??? What I wouldn't give to have a piece of this cheesecake right now. It looks absolutely delicious! looks great, my husband requested it for his birthday, coming up in a few days, so thanks for the recipe. One question why do you have to bake it ? can you not just leave it to set in the fridge. This is just gorgeous… I like that you baked it even though it's eggless. Very nice Anushruti! EL: You can have a big slice of this cake my dear. Kiran: This recipe calls for baking in the oven because it helps to set the cheesecake much better than I think leaving it in the refrigerator would. Woow!!! cheese cake looks perfect n delicious,,it came out in perfect texture…me n my hubby like the cheese cake very much we r great fan of cheesecake with syrup or with berry sauce… but i hv nt tried to make personally sure will try it soon,,first time here dear,,you got such a nice space with nice recipes..
Anu-akka,looks very yummy! Loved the shots too. Preethi: I havent tried this recipe with any other fruit other than strawberry, but I see no reason why it shouldnt work with other fruits like mangoes, apricots or peaches, provided you make a few adjustments with the sugar considering strawberries are tart and not as sweet as some other fruits. If you try it let me know how it works. That said, the mango cheesecake looks tedious but is not as complicated. It is truly one of my most prized recipes. Do give it a try if you are a lover of cheesecakes. Being a staunch vegetarian myself, I was always stumped at not being able to eat those luscious looking cheesecakes. Thank you for your nice words. Good luck! Hope you doing well. Tried the above recipe with canned Mango puree and it all worked out well. I did however use the crust and the glazing method mentioned in your original Mango cheesecake recipe. So in way, I kind of mixed and matched to work with ingredients available here. Once again, thank you and good luck! You can use Amul Cheese spread, it works just as well and is delicious! I made a cheesecake following your recipe yesterday and it turned out lovely! Cheesecake is my most favourite dessert and I too prefer it to be eggless. I'm a vegetarian too and a really big foodie. I also like your website, good presentation. MOOOOOOOOO AAAAAAAAH(for the strawberry cheesecake). What a delightful sight? i wish I could take bite from that. Your photographs are beautiful and the blog is absolutely neat, user friendly, poised etc. I love blogging the Hoycowvegan.net site, the author being Vaishali Honawar as well. Hers is also a delight in itself. Will I be able to get an amazing blueberry cheesecake if I replace all strawberries with blueberries? Because blueberries just came in India and they don't stay for long! Vihan: Yes, you could try this with blueberries…let me know how it went if you happen to make it. Your cake sounds delicious, but I wanted to know if its a good idea to bake it? will it not melt or be runny ??? This is one mouthwatering recipe. I'm absolutely in love with your website. It's got such easy tasty vegetarian dishes which is great because it's so hard to find authentic vegetarian dishes these days. I read somewhere that you live in Bombay. The reason I ask is because I always have to make a trip to Crawford for ingredients I cant easily find. Are there any particular stores you frequent for ingredients? Also have you tried making a gelatin free pannacotta? If so please do share your recipe. Melissa: You can try Hypercity, Godrej Nature's Basket, etc Will try and post a panna cotta recipe. Thank you for your nice words! I was wondering is it okay if I don't strain the yoghurt overnight? blais3rd: It is important to strain the yogurt to drain off its water. The cheesecake sets properly if you use thick yogurt with all its water drained off! sita: I wanted to make a cheesecake with commonly available ingredients and paneer is the most common cheese available in India and that's why I made the mango cheesecake with paneer cheese which can easily be substituted with well drained ricotta. Besides at that time cream cheese was not easily available as it is now. The paneer cheese also gives a beautiful texture, taste and body to the vegetarian cheesecake especially since we are not using gelatine. You can try using mango here but it won't be the same like the original cheesecake recipe. Sounds good, but I do not use dairy. Do you have any suggestions for a dairy free cheesecake? Thanks for the recipe… it was perfect !!!!! Fay: I'm so sorry but I havent tried dairy free versions of cheesecake. You could substitute with vegan equivalents and get good results. can we use any other substitute for cream cheese because it is not easily available in jaipur? 1. After pressing the crust ingredients, do I need to bake the crust before pouring the cheesecake mixture? 2. Can I use sour cream instead of drained youghurt? Swarna: As stated in the recipe, you need not pre bake this crust. I havent tried this with sour cream so I can't guarantee results. Eeep! Great recipe, Thanks for sharing 😀 Its actually in the oven, baking, as i type this. hi, I am comparing this recipe of yours with your mango cheesecake which we tried yesterday. It was wonderful! I am wondering if it would work out if I replace the mango with strawberries and follow the exact steps – instead of using this recipe as I rather do away with the condensed milk. Do you think it will work? Why is this recipe a baked one while the mango's is non-bake – any reasons? Rukmini: You can try soft paneer. Reshu: That's wonderful! You are most welcome! carmen: It is very unusual. You have to be very gentle in spreading the topping over the cake and if you have measured the cheesecake ingredients right and not subjected it to very high temperatures then your topping won't sink. d texture dint came out….should i use gelatin to get that texture…!!!?? Isha: I don't use gelatine in my recipes. If you measure the ingredients properly and follow the instructions, this is quite a simple cake to make. hey i just went through your recipe and i really am going to try it out in the next day or two. firstly, what exactly can be a substitute for cream cheese? malai paneer would do? are different cream cheese available in hypercity? Any other low priced cream cheese there is? Shubhi: You can use soft paneer cheese instead of cream cheese. I think Brittania makes plain cream cheese now. Congratulations on a site that so many people enjoy! I looked thru all posted comments to see if I could find my answer there, but no luck… I found your recipe while looking for things to do with a big bag of frozen strawberries I have. Any chance I could use frozen strawberries in this recipe instead of fresh? Or will that add too much water and prevent setting? Sahari: Thanks for your kind words. Yes you could use frozen strawberries here. Just make sure you thaw them completely and dry them up as much as you can with thick paper towels before using them. Hi Amushruti — thanks for your reply, but I couldn't wait so I ended up buying fresh strawberries anyway! My husband is in heaven over this cheesecake, so thank you thank you thank you. I'm making a second one tonight because I had a minor mess-up first time around: I ended up pouring the topping strawberry puree (w/ sugar) in the cake part of the recipe and didn't catch it until it was time to pour the topping on top. Plus, I had difficulty pouring the topping on w/o having it 'enter' the cake (ended up w/ a bit of a crater in the middle). I'd like to offer a tip for this part: pour the sugared puree into a flat colander and let it drip onto the cake surface. Plus, 1/2 C strawberries (for me anyway) isn't enough to cover nicely, so I doubled that part. Thanks again! I tried your reciepe today, I havent tasted it yet. Its in the fridge cooling. I have a question. I used Cream and not Cream Cheese. Is there a difference between the two? Does this mean I have messed everything up? I tried this cheesecake, but as did not have all the ingredients for the crust I substituted with Graham Crackers mixed with little sugar & butter. My daughter and I, we made it at 12.30 in the night, it was relatively easy and worth the staying up. The cheesecake was absolutely divine, everyone absolutely loved it. Thank you for the vegetarian recipe. Pari: You need to use cream cheese and not cream here. You will get a soft and liquidy pudding if you use cream. It will be delicious none the less! Swati: Yes you can! It would be delicious with blueberries too. Do send a picture that I can put up on the facebook page https://www.facebook.com/pages/divinetaste/72138112414?ref=hl if you happen to make it. Can I use digestive biscuits for the crust and vegetarian jelly layer for the topping?? Leonie: Greek yogurt is very thick but it still would require draining to remove the whey. I used thick yogurt similar to Greek yogurt and all the whey water had to be drained out. Did you use a cheesecloth for this purpose? I'm not sure about fruit yogurt but you will get good results if you use Greek yogurt. Thankyou Anushruti for your prompt reply, maybe the fruit stopped the whey and I used a Chux (new one) and maybe that asborbed the whey rather than let it go through. Will try and find some cheesecloth or something similar, will ask at the material shop. Also will use Greek yoghurt. Looking forward to making the cheesecake for my godson who is vegetarian. My 19 month old son has recently been diagnosed with an egg, soy, and nut allergy (and more). I made this recipe for Thanksgiving to take with me to family celebrations, so he could have desert. I made it with a simple pie crust instead of the nut based crust as stated here. It was SOOOOO delicious! Thank you! I am loving your recipes for our family! Ali: Thanks for the feedback! Pls pardon me for the basic question but isn't this 2 and a half cups of yoghurt reduced to 1 and a half? Kavitha: Nice to hear you enjoyed my recipes. Will post the tiramisu soon.. Loved your cheese cake recipe. I have a doubt though. 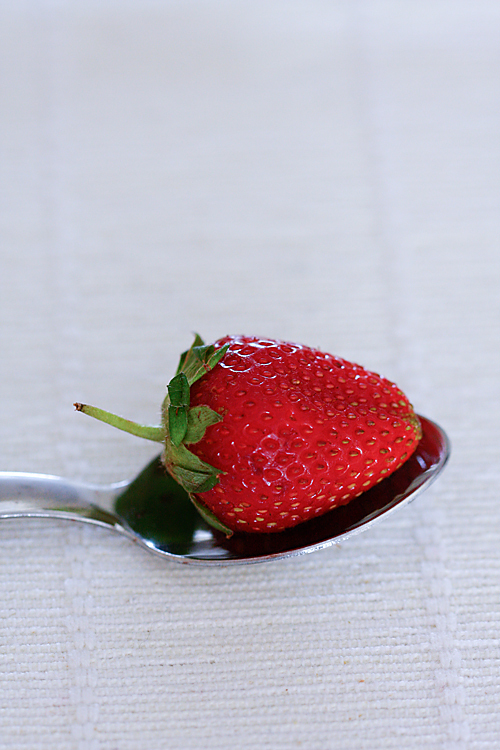 You have mentioned 1 cup strawberries, pureed, so how much puree do we get exactly. or how much strawberry puree need to be added. Ritu: Just take a cup, fill it up with strawberries and puree them. Hi, my cheese cake mixture is completely ready to go in th oven…. Had one last min question… It's too last min, hence just trying my luck writing to u… When u say 'bake'… Is it only bottom heating?… Ot both top and bottom heating?? Top and bottom, centre placement. Hi, thanks so v much for the prompt reply.. Really do appreciate that. N th cheese cake turned out lovely.. Again thanks to you for ur perfect n detailed recepie . I don't end up writing to u often but am a great admirer of ur work, n always look forward to your posts. Anushruti, Happy Mother's day . I am a vegetarian I love your recipe am going to try and bake today with blueberries I do not have strawberries (my favourite too) the 1st time I tried a strawberry cheesecake was in UK at oxford street Selfridges it was marvellous at that time I was not a plant eater . warmest regards . Thank you for the recipe, it was just like the name of your website, divine! Finally a gelatin-free vegetarian recipe, and the use of hung curd and condensed milk instead of cream cheese economises the cake. Your recipe made set me off a cheesecake baking spree. Love your website. I had a question, if I wanted to make a blueberry cheesecake, would substituting the strawberries in the above recipe with blueberries work? Thank you so much, I'll try the blueberry cheesecake today. Oh I'm so sorry, I did not see the Search Box. I tried the same recipe with blueberries, just adjusting the amount of blueberries I put in and it turned out really delicious and the recipe for the crust is the best out there. The best compliment I received was that it was better than Moshe's signature blueberry cheesecake, and the credit for that obviously goes to you. Thank you for this amazing recipe that works perfectly with a lot of different fruits. Made this cheesecake with mango and quark (instead of strawberry and yoghurt)- turned out amazing!! Lovely eggless recipe! Had a quick question- can this cheesecake be frozen for later use? Ronak: Nice to know that you tried this recipe with blurberries with great success! suchi: Yes you can freeze it for later use. Quark and mango sounds lovely! I made this cheesse cake for my mum's birthday and everyone was absolutely delighted. Thanku for running this blog which has amazing eggless baking recipes for vegetarians like us..hope you could someday share the recipe of eggless waffles and mushroom risotto..!! Thanku and keep up the good work. P.S. You have really taught me a lot in the field of baking. I thank you from the bottom of my heart. All the best to u.
Sukriti: Thank you so much for the feedback! I'm happy I have been of help to you. Hello!! Great to come across a delicious vegetarian recipe. Just needed to clarify whether you have strained the seeds from the strawberry puree or have let it remain? Hello!! I just baked the cheesecake and have another query. How can we test that the cheesecake has set in the oven because it is quite wobbly and soft. I have kept it in the oven for 45 mins but it is quite soft and the topping has started to turn darker and there are bubbles coming from it as if its boiling. I anyways have removed it from the oven but am confused about cooking part. Please kindly help and guide on the same. Anjani: No I have not strained the seeds.The seeds of a strawberry are very tiny and when ground they get mashed up into a smooth paste and will hardly be noticeable. Anjani: Cool the cheesecake and chill in the refrigerator for it to set. I was interested to make the cheesecake, unfortunately don't have any fruits on me. Can I still go ahead by omitting the 1 cup strawberry purée. I was wondering about the consistency. Missed asking another doubt in my previous post, we require 600 gms of hung yogurt or 600 grams yogurt is hung overnight to get 1 1/2 cup of hung yogurt? Diivya: You can try making my chocolate mascarpone cheesecake if you dont have fruits on hand. It is mentioned in the recipe that 600 gm (1 1/2 cup) yogurt, drained overnight in a cheesecloth covered strainer to make 3/4 cup thick yogurt meaning 600 gm yogurt before it is hung. Good luck! I have a doubt how does this cheese cake set without agar agar or gelatin.? Shabnaz: There is no need for agar agar here as this is a baked cheesecake and the ingredients combine together in the presence of heat giving one a beautifully set cheesecake. Can I use ricotta cheese? I have some with me and I don't know how to use it up. Aarthi: You can try using it but you need to drain the water well by hanging it in a muslin cloth for about 2 hours. Came across this cheesecake , while searching for eggless cheesecakes . I plan to make it today , but I'm confused about a few things and need your guidance. I will be baking for just the two of us and would like to reduce the recipe by half .. Is that possible ? 1. I would like to top it with fresh fruit – so can I omit the strawberry purée and just add the basic vanilla flavor ? Will it affect the cake in any way ? 2. One cup measure is 250 ml – I use the standardized cup – so just confused on the final amount of yogurt being used . I'm sorry if it's a stupid question , but I went through the comments and I'm still confused . Would love to make it for his birthday . Looking forward to your reply ! 1. Can I reduce the quantity by half ? 2. Is it okay if I don't add strawberry purée and omit it completely ? Will it affect the texture of the cheesecake ? 3. When you say 3/4 th cup , are you referring to the standard cup measurement of 6oz ? Sorry in a hurry to bake , so posting again . Eagerly waiting for your reply ! Ritika: Yes you can halve the recipe. You can omit the strawberry as well. Take 1 1 /2 cups of yogurt and drain it well until it reduces to 3/4th quantity. Hope this helps! Good luck! Ritika: You are most welcome! 1) You have mentioned to bake till it is set..how do we test that? 2) Do we have to unmould the cheesecake after it has cooled and then refrigerate it or should it be kept in the pan itself? Ashwini- The cheesecake should not be wiggly in the centre. You can unmould the cheesecake after it has cooled down. I have some doubts that, can we keep the batter simple as not putting the fruit purée in to it? hi.. i have few doubts regarding this baked cheesecake..
1. can i try this recipe for a small quantity dividing the measurements by 4..
2. if i want to try a flavourless baked cheesecake or NY style cheesecake.. what substitute should i use for egg? hung curd? corn flour.. most of the recipes over the net calls for eggs for flavourless cheesecake. what is the egg substitute works best..
Aayush: You can try! It will be a plain cheesecake. bharathi: 1. You can try. If your measurements are precise, you will get it right! 2. I can't give you one replacement for egg as such as it depends on the recipe and a whole lot of other ingredients. Last time I baked this recipe with strawberries and everyone loved it…:-) This time can I replace strawberries with blueberry crush..Please reply soon as I am planning to make this for my friends birthday which is in 2 days..!! sukriti: Using blueberry crush, wont be like using fresh blueberries. I made this cheese cake with nutrichoice biscuits crust,Philadelphia cream cheese,Greek yogurt and condensed milk and strawberries a few days back when I was in Germeny.my problem now is that the season of strawberries is gone here and my son wants the strawberry cheese cake here .Can I replace the strawberries with the premium strawberry crush? jimmy: Sorry for the late response. Maybe you can replace strawberry jam, adjusting the sugar instead of strawberry crush. If you try it, let me know how it turned out. I have made this cheesecake earlier and it came out perfect.however this time I don't remember how it was when I took it out of the oven.can you please tell me how do we know if it is done in the oven..
Megha- It needs to be set and not wiggly in the centre. A little shakiness in the centre is fine, but only a little bit, because if it wiggles too much then it means its not set. Alos, it firms up while cooling down. I made this tonight for a family dinner and everybody was blown away!! Thanks so much Anushruti !! Amritha- The cake sets as it chills. Light brown edges is fine. You need to use a springform pan to make this cake. That way you can unmould easily. Hi I want to make this cheesecake in a jar, would I still need to bake it? Would it be possible to substitute the condense milk with something healthier? Hey! Your recipe seems so nice and i want to try it but do you think i could subsitute the cream cheese with quark? And you really dont need any starch or anything to make it set by baking? Anukampana- I havent tried this recipe with quark. It works best with cream cheese. You can try mixing in 1/2 the quantity of cream cheese with quark. Hi…thanks for the most amazing recipes always… I always make your black forest cake and it's a big hit with everyone. Can you pls let me know if we can replace the almond flour and walnut flour with anything else..my kidoo is allergic to nuts and she would love to have this cake. Thank you. Which other fruit can be used instead of strawberries?would apple be a good option? I would suggest other berries in place of strawberry. I havent really tried making this recipe with any other fruit. Could you please make salt biscuits recipe just like 50-50 or Krack Jack without using eggs or yeast? Thank you. We tried this vegetarian strawberry cheesecake before – and liked it a lot! Many of the eggless/egg-free recipes on the Divine Taste website seem very interesting – we certainly would like to try more of them over time. My question is: do you have any general suggestions on how to convert a with-egg cheesecake recipe to an egg-free one? Specifically, do you have any suggestions on egg-replacement ingredient options? And, further, what general conversion can you recommend (e.g. if you recommend to swap eggs with agar-agar, how much of agar-agar do you suggest per egg in the original recipe)? Anand- Every recipe is different so its usually not possible to suggest generalised substitutions. I have never swapped eggs with agar agar. Baked this for a cheesecake lover friend's 50th birthday. Everyone loved it! Thank u so much for the simple yet perfect recipe..
You can make this nut free by replacing the nuts with the flour!